Biofinity contact lenses do as the name indicates; provide a natural wear experience and support eye health. Made by optical heavyweights CooperVision, these lenses are custom engineered to be light and comfortable yet durable, and supply clear vision and excellent depth of focus. This is a small but highly effective family of contact lenses. There are lenses for young wearers, along with torics and multifocals for older wearers in need of a lens that supplies sharp focus on objects close up, far away and in-between. Choose from daily disposables, monthly and extended wear Biofinity contact lenses. All-day comfort is a key feature of all Biofinity contact lenses. It’s all thanks to CooperVision’s Aquaform Comfort Science technology, which uses soft, durable and breathable materials to produce lenses that allow oxygen to filter through to the eye constantly. This technology was developed to work with the eye’s natural PH and water levels. This means eyes stay naturally hydrated and free from protein and deposit build-up. It’s not just comfort that makes Biofinity contact lenses worth your money. The vision quality is outstanding. Bausch & Lomb designed each lens to give the wearer excellent light focus, image resolution and depth. Finally, there’s the matter of shape and fit. 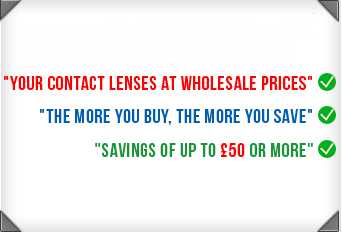 This family of lenses features a rounded edge that allows for ease of application and a secure but comfortable fit. Each Biofinity contact lens is flexible and able to stay in position whilst also allowing for the eye’s natural movement.